At one time or another, all kids act up and have less than ideal behaviour. Be it a screaming tantrum, aggression towards a sibling or a parent, throwing toys, lying or simply being rude and withdrawn. The majority of this behaviour, while incredibly frustrating and stressful for parents, is all developmentally normal. Behaviour problems develop when normal developmental behaviour becomes destructive. This is when we need to step in with strategies to help decrease the frequency and the intensity. There are so many different discipline techniques out there, a search of Google gives 21.6 million results!! How do we choose the “right” one that will give the best outcome for our child and our family (that’s what we want after all!)? In order to understand what we should do, we need to understand how to approach the problem. The key to solving behaviour problems is fixing and addressing the CAUSE, not just the outcome. The cause of a child having a tantrum maybe his feelings towards being told “no” when he wanted a new toy. The outcome is his screaming and hitting his mum as a result of his big feelings. This is the opposite of examining it. through the lens of communication. Instead, we help him learn to manage his emotions by connecting with him in the moment and reinforcing positive behaviour in a calm way. This way we are more likely to see an improvement in behaviour. This is achieved through attachment play. Attachment play (or play therapy) is based on attachment theory. This is different to attachment parenting – no breastfeeding, babywearing or co-sleeping required! In a nutshell, attachment theory states that the more securely attached a child is to their primary caregiver/s the more confidently they will explore their world and the faster their emotional and social development. A better attachment results in better outcomes for children and a more enjoyable family environment. When a child has a weakened attachment it is harder for them to control their emotions and their behaviour because they often don’t feel like they have the secure base to return to help them process what’s happening. As a child strengthens their attachment they will feel more confident to act through play problems they are experiencing. Through responsive parenting, caregivers can help their child work through their stress related to specific situations and learn how to respond differently in the future. 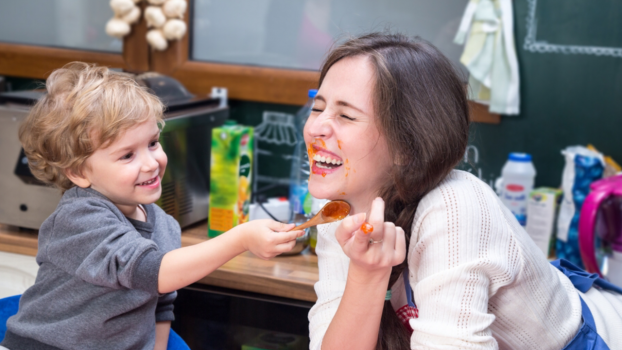 Attachment play is a way for children to reduce stress and anxiety through positive social interactions with loving caregivers. It produces oxytocin which is that lovely hormone that calms us down and connects us to ones we love. Attachment play stimulates the brain to rewire previously stressful situations as emotionally neutral, basically decreasing stress and anxiety. Children who feel overly stressed often have a weakened attachment to their caregivers. This goes around in circles because the weakened attachment causes more stress and anxiety, and it becomes a catch-22 situation. Children who experience more stress often have more behaviour problems. To improve behaviour problems parents we address our child’s stress level and their attachment with their primary caregiver. This is where attachment play comes into its own. It decreases stress levels in our child and strengthens their attachment. This has a positive benefit because not only will their child feel less stressed overall and when they are in a challenging situation of big emotions. As a result of their strengthen attachment, they will more likely feel as if they are able to come to their caregiver to help gain the support that they need to process future stressful situations. It’s an all-around win-win! 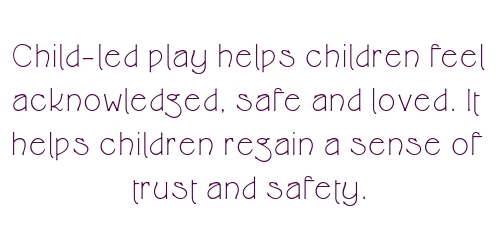 Child-led play is one of nine categories of attachment play. It is an evidenced-based technique to help address behaviour problems in children. Be on the floor or sitting at a table with your 100% full attention with your child (no phone – unless using it to set a timer, but then leave it out of immediate reach and up on a counter). Join in the play only when invited. If not invited then sit close and make yourself available for when they are ready. Avoid all analyzing / teaching – this is not what these sessions are for. Let them do whatever they want but within limits of not damaging property or hurting anyone. You may find that your child acts out conflicts with family or friends in play. It is normal and indicates feelings of safety. If they do, ask questions! Explore the situation with them. If appropriate you can help your child explore how the situation may be managed the next time it, or a similar situation occurs. 1. Follow your child’s lead and remain flexible. 7. Don’t do this strategic play if your child is crying. 8. It’s okay to say no to wanting to play – both child and mum! These are the very basics of attachment-based child-led play. We can then use strategies that build on these for behaviour problems (if they occur) as well as enhancing relationships with primary caregivers. 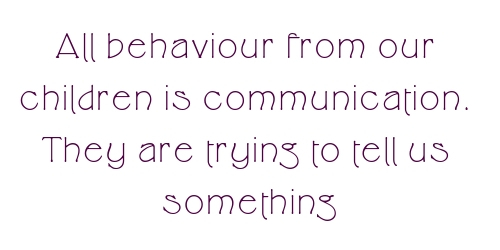 Remember that all behaviour is communication. The key to improving a family situation is to solve the underlying problem and not just looking at strategies as a band-aid. If you’d like to see how to use child-led play to help your child and family environment then check out my case-study video on how I helped mum use this process and my 5 C’s Discipline Framework with her aggressive 5-year-old. If you’d like to dive deeper into how this can work for your family then email me at heather@blissedoutmums.com.au. We can help create a plan to enhance your child’s attachment and improve their behaviour so life for your family is just that bit easier and more enjoyable.